The Scribe plugin has enthusiastic user reviews, claiming it has been a solid piece to their SEO puzzle and done near miraculous things for SEO. Scribe promises to increase your traffic without a lot of hassle, and does it in three ways: research, optimization, and connection. Scribe tells you what search engines will see your post as being about. We’ve been using Scribe for three months, and we have seen an increase in traffic. That alone is probably enough to convince some bloggers. There are a few things to consider before laying out the money for this plugin, however. In order to use Scribe properly, you need to have an SEO plugin already installed, such as the popular plugins WordPress SEO by Yoast, or the All In One SEO Pack. Scribe goes to work once you’ve written a blog post and set up your SEO title and meta description in the SEO plugin. The first step is to chose the keyword(s) for your post, and use the Scribe keyword research option. 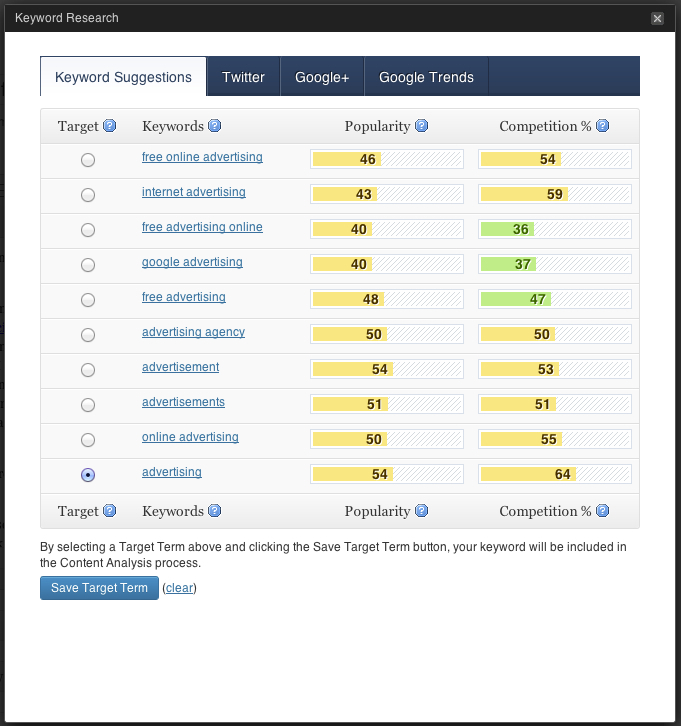 It will tell you variants on the keyword, how popular it is, and what your competition will be. You can also see, from the same pane, the action your keyword is getting on Twitter, Google+, and Google Trends. Scribe provides one-stop keyword research. 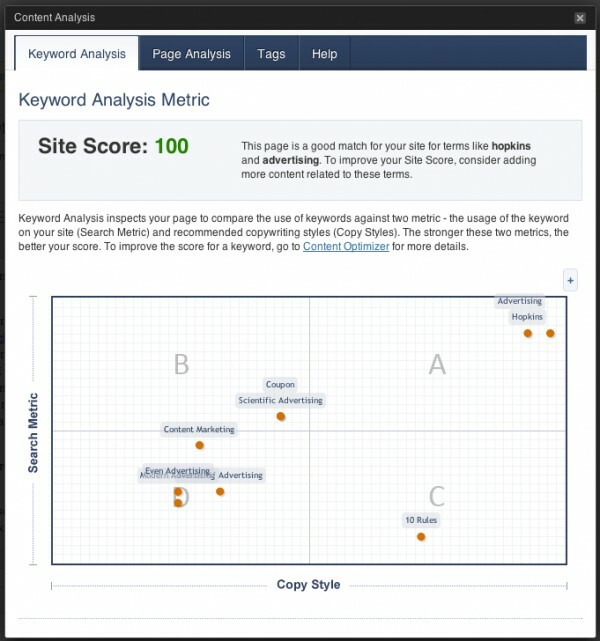 Once you’ve chosen your keyword, you’ll use the Scribe content optimizer, which basically looks at your post, your keywords, what you’ve put in the SEO plugin, and the rest of your site. It gives you a score, assesses the keywords you’ve used in your post and gives you tips on what to do to optimize your content and make it better or improve keyword rank for the keyword you selected, and suggests post tags to add. 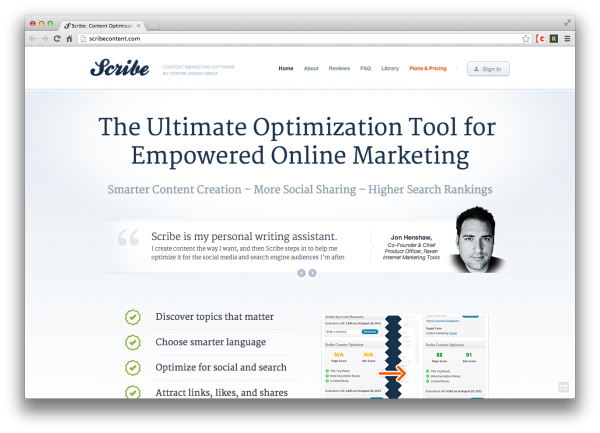 Scribe analyzes your content based on keywords and across your entire site. The final step is to use the Scribe link building component to research and find internal links on your own blog. We don’t use this as much for the simple reason that we remember to do this manually. For a large blog or one written by many people, it would be a handy feature since you might not be as apt to remember all of the posts written for your blog. Scribe allows you to select keywords from your post and find links that would apply. It helps you put your post in perspective as part of your whole blog, not just optimizing one post. Scribe has a limit on how many evaluations and keyword searches you can do each month. For example, they estimate about 3-5 keyword searches for every post. The plan you choose is based on how many of these you’ll need. Scribe makes it easy to do things we’d have to put time into doing manually – it insists you pay attention to SEO – but that doesn’t mean the entire user experience is a good one. Mainly, Scribe is slow. There are clunky moments of waiting and refreshing. As a WordPress user with a few bad moments of WordPress death under my belt, I always hold my breath when I click an option in Scribe and the entire screen goes blank for several moments before it refreshes. As of yet, I’ve never lost content, but it is mildly terrifying that every action causes a save/refresh when most other plugins allow you to control that yourself with the save button. Scribe is worth it if you’re not bothering to consider SEO. There isn’t much that Scribe does that you couldn’t do yourself if you wanted to take the time and do the research for every post. Its selling point is that it brings all of that into WordPress so you can do it from one place. The question is really: is that convenience worth the price? At $97 per month, that’s up to you. For some bloggers, the answer is probably no. It is possible to do what Scribe does on your own. This is purely about convenience and time, and not magic. If lack of time is keeping you from doing SEO right, Scribe will help. As I said, we’ve seen an increase in traffic since December, and while not all of it can necessarily be attributed to Scribe, the plugin has done its job in “forcing” us to optimize each post. Used correctly, Scribe will help you increase traffic. Any time you beef up your efforts and optimize your content, you’ll see improvement. Scribe won’t turn you into an SEO genius. It gives you tools to do research but the decision and understanding of what you’re seeing is up to you. Bloggers shouldn’t purchase the plugin and expect it to magically fix everything. Like any tool, it’s as good as the person using it.